The Actor Class Browser allows you to view the Actors available in your Unreal Engine build. Actors are created by UnrealScript classes (and sometimes native C++ code) with logic to define their attributes, behavior, and state. These Actors are often used in levels. Almost everything in a world of levels is an Actor, including Lights, Static Meshes, and Pawns. 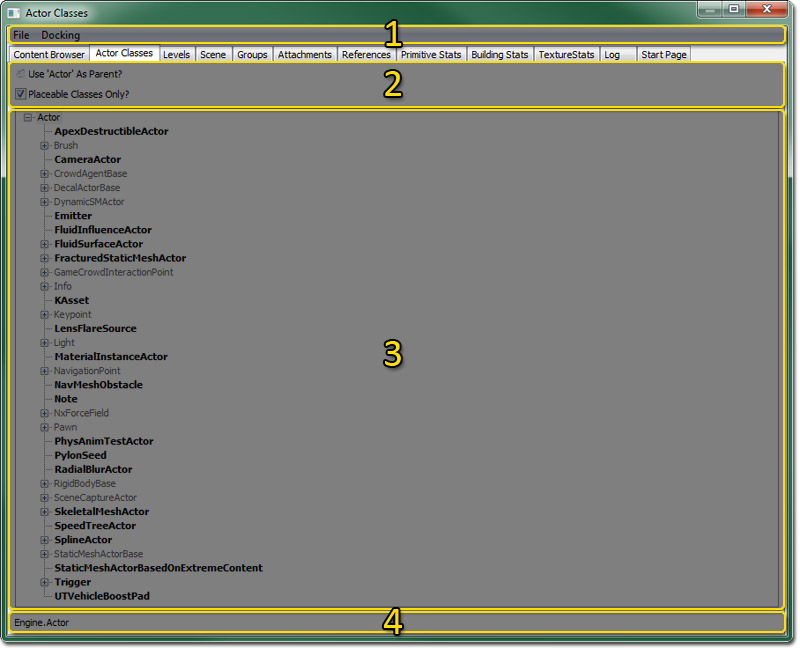 The Actor Class Browser can be accessed through the View menu of the level editor. 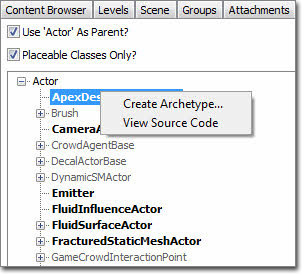 Selecting the Browser Windows > Actor Classes option will open the Actor Class Browser directly. Another option is to click the Open the Content Browser button in the main level editor toolbar and then select the Actor Classes tab in the browser window that opens. Open Package - From here you can open UnrealScript compiled code .u packages. Export All Scripts - This option exports all classes to UnrealScript class .uc files which can later be rebuilt. Docked - This option will dock a currently floating browser into the main browser window. When the current browser is docked, this option appears checked. Floating - This option will undock a docked browser from the main browser window causing it to become a floating browser in its own window. When the current browser is floating, this option will be checked. Clone Browser - This option will create a duplicate of the current browser. Remove Browser - This option will remove or delete the current browser. This option is only enabled on cloned browser windows. Use Actor as parent? - With this toggle checked, the Actor tree displayed below will start with "Actor" as the highest level. If not checked, then "Object" will be used as the highest level. Placeable classes only? - By checking this toggle, all of the non-placeable classes that do not have placeable classes below them will be pruned from the Actor tree. Placeable Actors are shown in bold in the Actor tree. The Actor tree displays all of the Actors available to you. To place an actor in the world, select it in the Actor Tree and then right click in one of the viewports where you want it. Towards the top of the menu that pops up when you right click should be the option: "Add Selected Actor Here"
Note that some Actors are in bold while others are not. The Actors in bold are the Actors that you can place, the others are just there for structure in the classes. To expand a branch of the Actor tree, click on the plus sign in a box next to the Actor and it will display all of the actors below it in the tree. To retract a branch of the Actor tree, click on the minus sign in a box next to the Actor and it will hide all of the actors below it in the tree. Create Archetype… - This option will enable you to create a new archetype using the current class as a basis which will then be accessible through the Content Browser for modification. View Source Code - This option will open the UnrealScript class for the current class in the default text editor for the operating system. This is a temp file and is simply for quickly viewing the code. No modifications can be made here.